According to your requests i've made this guide to give you all the basic idea about AK-47 "deadliest weapon in CS 1.6". Using AK-47 is not easy its a little tricky, everyday we see lots of noobs spraying with AK but thats not the way we use AK-47. 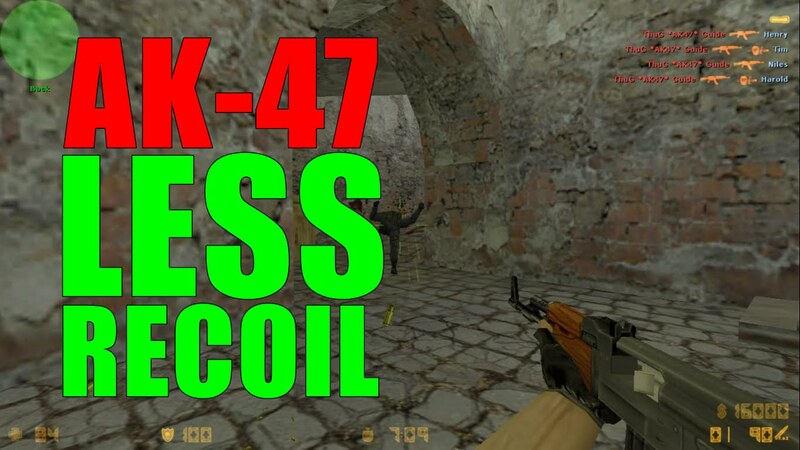 I'm gonna help you understand the basics of using a rifle with very high recoil, because of this high recoil AK is known as a pro's gun and its tricky to handle. So we start with very basic level. Beginners, use this gun normally, get used with the recoil rate, it recoils rate is much higher than other weapons. At first, this will be very irritating sometimes, you cant even kill enemies in very close range as bullets spread in a circular fashion around the enemy leaving no bullet hitting them. The procedure is you must fire in three bullet sets i.e. you need to hold the left mouse click till the three bullets are fired. So firstly try to have control over number of bullets fired ( not 2 not 4 exactly 3). Secondly aim the spot where you want to hit. The last bullet hits the head. The reason for using 3 bullets is, you can easily aim at enemy's stomach (instead of aiming head directly) and recoil can take you to head. If you fire 2 bullets, head spot is not reached and hence enemy is still alive. If you fire 4 bullets, the 4th bullet deviates much away from enemy's body due to high recoil rate. "Head shot is always lethal". The procedure to use this is very simple just fire single bullet at a time, do not hold the left mouse click, just a single click. Crosshair placement is very important in this type of aiming, always aim for head for single bullet firing. The reason for single bullet firing is to reduce the recoil and hit exactly inside your crosshair. Keep tapping the left click don't let your enemy move and you can end up killing them. In starting it would be very hard to use this one bullet firing but practice will make you good. There are different patterns in which AK-47 sprays, you can learn them and control your rifle accordingly. In CS 1.6 these four are the patterns in which AK sprays, to avoid these recoils just move your mouse in just opposite direction. This will result in a more concentrated sprays at a particular portion. Here is a video by "HEATON" in which he tells you about the use of AK according to the distance of your enemy, do watch this. Comment here for any queries.